Speaking of Wookiees, I believe a while back in a Q&A, Hasbro said that there was another Wookiee Warrior in the works... I wonder what happened? Or if we'll see something later on with the Black Series? Even if it's not a generic army building Wookiee and its a more specific character like Chewie or Tarfful I'd be pretty excited. We've already seen how terrific the more recent 3.75" scale Wookiees look and function....imagine how terrific a 6" walking carpet with, say, a removable bandolier would be. "We lived through another day... it's a good excuse to celebrate." I think for Chewbacca, the versions that are out now are just fine. However, repacking the Early Bird version onto a Black Series or TVC card would be a wise move I think, and even better if they included the bag of parts with C-3PO from ESB. That being said, I'm craving for Hasbro to make another big Wookiee - Tarfull would be cool like you said. They could reuse most of the parts for a new Wookiee Warrior too. I sure wouldn't object to seeing the Early Bird Chewie tweaked with some additional play-value gear and released on a Black Series card. 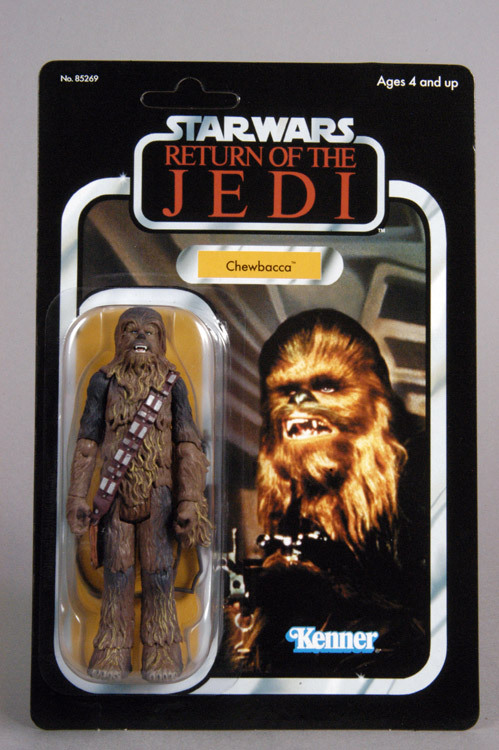 We have yet to receive a Vintage Collection Chewbacca so that might be the next-best thing Hasbro could do for collectors, and the last Chewie on store pegs was the 2010-11 Saga Legends issue. We're past due for another Chewbacca. But yeah, they should have put him onto a TVC card in some manner in 2011 or 2012. It's weird, really that they didn't. Yeah, that's semi-Vintage. It is, but it isn't. If they could redo the Endor Trench Coat Han after releasing him in the clamshell figures from 2006 then they probably should have released a Chewbacca at some point over the past two years, but oh well. What's done is done. All we can assume is that they'll tackle him when TVC makes its return and things will be awesome and dandy. Wookiee exploitation, another miss for Hasbro. Perhaps we'll get new Wookiee Warrior army builders in the 5-joint Saga Legends line? It's not the articulation I'd prefer in a Wookiee after all these years of embarrassing riches of joints but an exceptionally well sculpted and painted $5.99 Wookiee from Episode III would tie in with the theme of the first wave that was revealed at Toy Fair (ROTS). I'd buy several if they looked great! That could be cool, but I really am hoping for a super articulated one. Yeah, that's my preference for certain. It'd certainly make for a nice ROTS entry in the Black Series line. That said, if the only option in the near term would be a five-joint Saga Legends figure it'd be acceptable so long as the paint job were terrific. A cheap army builder is better than nothing, and given how Hasbro drags it feet with some characters and new versions of those characters I wouldn't be surprised if it took them a little while to crank out a 14-joint Wookiee Warrior. I need several for a new photonovel, so that's why I'm hoping for super-articulated. Keep your fingers crossed. Sometimes The Big H pleasantly surprises us!